Prior to the 1937 legislative session, Texas governors had unlimited power to grant pardons, paroles, or commutation of sentences. It had been this way in ‘the old states’ and, because that was the way it was done where they left to come to Texas, that’s the way the laws were written by the Anglo-Texans who controlled the state’s government. As you might expect—and as still goes on in several other states—this led to abuses of official power. Simply, it led to the sale of pardons, paroles, and commutation of sentences. In a sense, Texas governors ‘made retirement’ off the sale of pardons, paroles, and commutations. Governor Pat Neff, known as ‘Pardonin’ Pat,’ ‘sold’ a horse he owned literally hundreds of times during his administration. Somehow the horse never left Gov. Neff’s possession, but the people who ‘bought’ the horse were soon rewarded with a family member coming home from prison, a full gubernatorial pardon in his or her pocket. There was even a sliding scale, based on the family’s wealth and social prestige and on the nature and seriousness of the offense to be pardoned. A burglary of a habitation, especially if no one got hurt, could be pardoned for a few hundred dollars. Pardon in a case of murder could run into the thousands by the early 20th century. James E. Ferguson was notorious for selling pardons, as was his wife, Miriam A. W. Ferguson. (Her maiden name was Miriam Amanda Wallace, and that’s where the ‘Maw’ came from, just like James Ewell Brown Stuart was known as ‘Jeb.’) When he was impeached, convicted, and barred from holding further elective or appointive office in the state, he simply had his wife run for governor. Until Bill Clements, she was the only person in Texas history to serve two non-consecutive terms as governor. On her final day in office, Gov. ‘Maw’ Ferguson issued over 2,000 pardons, many of them to hardened felons, each one paid for in cash. She realized something over $2,000,000 from this, which furnished her and Jim with a comfortable retirement cushion when they moved from the Governor’s Mansion to a luxurious house on Enfield Road in Austin. This action infuriated a great many people, including some very influential politicians and judges. Gov. James V. Allred took office following the last Ferguson administration. Allred was a reformer, as were a number of new state Representatives and Senators. The Texas Legislature passed, and Gov. Allred signed, a law creating the Texas Board of Pardons and Paroles. This law took the power of direct pardon away from the Governor of Texas. He still has to sign a pardon, but on his own he can only issue a single thirty-day stay of execution in a capital case. To be considered for a pardon, an attorney—or attorneys—for the convict must present a petition for pardon (or parole, or commutation of sentence) to the Board of Pardons and Paroles. The Board can take one of three actions on the petition. It can forward the petition to the Governor recommending the action being pled be granted. It can forward the petition recommending he not grant the plea. It can simply take no action on the plea, in which case the Governor never receives a recommendation. The Governor has the power to deny the Board’s recommendation and refuse to issue a recommended pardon. He also has the power, in the event a petition is forwarded with the recommendation the action not be taken, to override the recommendation and take favorable action on the petition, but so far this has apparently never happened. The Board is appointed by the Governor, with the Senate approving the appointments. This is usually just a formality. Members of the Board are private citizens, not holders of elected office. They are usually very influential people statewide. This has made the Board almost totally immune to lobbying and other influences. 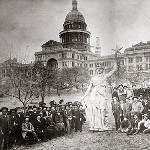 Until 1937, getting a pardon for a crime—including a murder—was simply a matter of allowing the individual to serve three or four years, then going to Austin, to the Governor’s office, with a paper sack full of money. An attorney or other representative of the convict’s family had already worked out, with the Governor, the price of the pardon. The family brought the money, it was quietly handed over, and a day or so later a representative of the Governor’s office showed up at the prison with the signed pardon in hand. A few hours later the former convict walked away from the prison not merely free, but with all his rights restored. Today the process is much longer and much more difficult. Attorneys representing the family must present a petition for pardon to the Board of Pardons and Paroles. The Board then considers the petition, a process which may take months or even years. They look into the background of the petitioner, who is usually on parole by the time the petition is submitted. They research the background and community standing of anyone who co-sponsors the petition. They look at the petitioner’s associates and social life. If the petitioner has been a stable, law-abiding citizen for a number of years, has not been in contact with those he or she associated with during the petitioner’s criminal career, and the petitioner has a stable home life, it is entirely likely the petition will arrive on the Governor’s desk with a recommendation the pardon be granted. It may, however, take several years for that to happen. When created, the Texas Board of Pardons and Paroles was unique. No other state had ever done anything like that. Some states followed the Texas example, eliminating the sale of pardons. In others, the major consideration for a pardon remains the price.